There may not be a foolproof formula to creating dominant relievers, but it might involve a look at the D-backs system. For the second straight season, another team acquired a pitcher from Arizona who finished the year as the best reliever in the Minor Leagues. 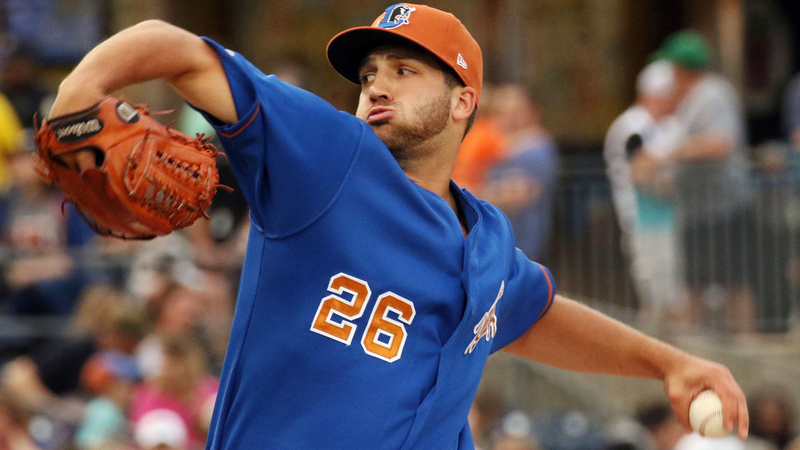 In 2018, after a sterling start with his former organization, Colin Poche opened eyes at two levels and reached the doorstep of the Majors with four brilliant months at Triple-A. In doing so, he picked up this year's staff MiLBY Award as Top Relief Pitcher. "I kind of knew that there was a list involved with the player-to-be-named-later thing," said Poche, acquired by the Rays as the final piece of a three-team February trade with the D-backs and Yankees. "I knew that I was kind of being scouted that whole time. Word gets out through the organization like, 'Oh, the deadline's this day and these guys might get traded.' I knew maybe something might be going on." Poche was already in the midst of a breakout year when he was dealt to Tampa Bay on May 1. In nine outings to start the season with Double-A Jackson, the 24-year-old had not allowed a run, kept opponents to a .086 average and struck out 23 in just 11 innings. The Rays were hooked, and it just so happened their Double-A affiliate was arriving in town to pick up its newest member. "I packed my bag and went through one door to go to the visitors' locker room and play a five-game series in my home stadium as the away team against all my former teammates," said Poche, whose first series with Montgomery came in Jackson after being swapped on an off day. "It was one of the strangest experiences I've had on a baseball field for sure. "I think that was just good practice for me to know that something is going on off the field, something that I can't really control what happens, and I was able to go on the field and handle my business separate from what was happening off of it. I think that's going to help me later in my career." The Dallas Baptist product didn't stay long with the Biscuits. After three more scoreless outings in the Southern League, he got the bump to Triple-A Durham and promptly took off. Nearly all observers point to one key. "It's the fastball, and it's the fastball command," Durham manager Jared Sandberg said. "He attacks hitters. He repeats his delivery. He's very athletic, tremendous worker in between times out on the mound, but by far, it's the fastball. He added a curveball midseason to go with his slider as well, and that's more of not a strikeout pitch but more a pitch to get the hitters off the fastball. The curveball, he just tries to get it out in the zone or tries to strike it early. He's using the fastball early in the count, middle of the count, late in the count. It doesn't matter when it is, he's attacking with the fastball." Poche's heater might seem out of place in this chapter of baseball. Sitting 92-93 miles per hour in an era in which pitchers regularly average in the upper-90s and scrape triple digits, the lefty nevertheless blows hitters away. The Rays have an idea why. "There's a lot of new data out there and everything," Poche said. "They say my fastball, it backspins really well, so it ends up finishing higher than the batter [anticipates] it would. Basically that's just giving me the confidence to go out there and throw it until the hitter tells me I need to throw something else. The Rays have given me a bunch of data on my fastball and how it plays up. I basically go out there and utilize that as my main weapon." It could be spin rate or late life or a deceptive delivery. Or it could be a blend. "I think it's all of it," Sandberg said. "The arm stroke, the deception in his delivery so that he does hide the ball and then the ball jumps out of his hand. He's got good spin rate on the fastball and he's got good extension as well. He's getting down the mound (with his stride and release point), so that fastball at 92 plays way up. There were a couple of hitters that made some adjustments as they had some more at-bats against him, but the thing is there's so much deception that it doesn't matter if it's a left-handed hitter or right-handed hitter, the fastball really gets on the hitters." The Flower Mound, Texas, native debuted with three scoreless innings for the Bulls on May 11 before surrendering his first run of the season -- in his 14th outing at his third different stop -- four days later. That occurrence proved to be rare. Beginning on May 29, Poche went on a run of 13 scoreless outings in his next 14. Only six times in his 28 total Triple-A appearances did the southpaw allow runs -- never more than one in an outing and only three as a reliever. "Every time you go out there, you feel like you're going to get everybody out, and that's a good thing because you can sense that your teammates around you have confidence in you too," he said of the roll. "I feel like as a reliever that's huge because you're only going to come in for an inning or two late in the game, and your teammates have been out there grinding it out for two, three hours to get a lead. For them to see you come in a game and have confidence in you to shut it down, I think that just does wonders for you." Poche became a reliable presence for his manager. "Especially when he's got rest, he's able to go out there and go one time through the order," Sandberg said. "We didn't bring him in in the middle of an inning, leverage situations much, but he's fully capable of doing that. It gives us the upper hand when we have a guy like Colin sitting in the bullpen with rest. It's a huge bullet for us." Beyond his dependability, Poche's metrics were staggering. After leading the Minor Leagues in strikeout rate a year ago, the hurler struck out 78 batters in 50 Triple-A innings and 110 over 66 total frames for the season. With the Bulls, his K rate sat at 41.5 percent, Poche posted a 0.92 WHIP, and he limited Triple-A hitters to a .170 average, a swath of numbers that led Fangraphs to dub him the "most unhittable arm in the Minors." "He's pitching to a mold that we have in our system, but you also want to have guys that can do everything, whether they can sink it, they can throw the slider, other plus secondary pitches," Sandberg said. "Colin fits right in there with having a plus pitch and being able to go out there and not only defend himself but miss bats and produce some swing-and-miss." Poche's season was so good that his one main addition -- the curveball -- only got a mediocre grade from the pitcher who expects more by 2019. "I throw my fastball up a lot, so I wanted something with a lot of vertical break going down," he said. "When I first started throwing it, the break wasn't where I wanted. I didn't have command with it. Toward the end of the year, I started to get comfortable with it. I could tell when I was able to work that in the way I wanted to, it made my fastball even better. Going forward, that's going to be an important pitch to me. The better I can develop it this offseason to where it's ready to go next year, it will help me get hitters, even more advanced hitters, off my fastball." Another weapon is just what opposing hitters don't need from Poche. Any more, and the next lineup he faces might be wearing big league uniforms, similar to the track of 2017 Top Relief Pitcher Gabriel Moya, who Arizona traded to Minnesota in July that year. "It's exciting," Poche said of being so close to the Majors. "Like most players, it's been a dream of mine since I was really young. It's definitely exciting to think about, but I try not to get too caught up with it. I try to just focus on what I need to do each day to make that a possibility in the future." No matter when he arrives, the Rays are thrilled he's theirs. "Tremendous job by the scouting department to find him," Sandberg said. "I believe Colin spent some time in (Arizona's) extended spring training last year, in 2017, so there's a chance there wasn't much data on him. But our scouts did a tremendous job of scouting him, finding him and knowing what he's all about. Not only is he an incredible pitcher that put up great numbers, but he's also a tremendous worker and a great kid." Buoyed by a late surge in voting, Rockies right-hander Matt Pierpont added to his offseason accolades after another sterling season. Back at Double-A Hartford for the third straight year, the 2017 and 2018 Colorado Organization All-Star put together his longest and most complete year in a dominant campaign for the Yard Goats. "He's got an excellent changeup," Rockies senior director of player development Zach Wilson said. "It's a swing-and-miss changeup. It's one of those changeups where you know it's coming and sometimes you still can't hit it." Pierpont was terrific in 67 combined appearances for the Yard Goats between 2016 and 2017, posting a 2.50 ERA in 129 2/3 innings, but found himself back there again this year. Rather than shrinking with the return assignment, he blossomed. In 55 appearances, over a quarter of his 197 total outings as a professional, the Winthrop product saved 32 games in 34 chances, put up a 1.95 ERA and limited opposing hitters to a .209 average. The strikeouts are where he shined most. In 60 innings, Pierpont fanned 77 hitters, his strikeout rate spiking from 23.2 percent in 2017 to by far a career-high 31.8 percent this year. In three seasons in the Eastern League, the 27-year-old sports a 16-8 record, a 2.33 ERA, 34 saves and 204 strikeouts in 189 2/3 innings. Before asking the obvious question of why he's remained in Double-A, know the Rockies very much have their eyes on Pierpont's future. "We've been working and working to try and get him some experience at Triple-A," Wilson said. "That hopefully is the next step for him. He throws strikes and he's got a good changeup. That allows him to compete every time he goes out there, whether it's the eighth or ninth inning. Obviously he had a ton of saves and so he competes. He's a fighter, and he's got a quality pitch and throws strikes. That allows you to always have success at those upper levels." With the Rockies always in search of bullpen depth to handle the rigors of pitching at Triple-A Albuquerque and at Coors Field in the Majors, Pierpont has pitched himself to a place where he's tough to ignore.